The fully restored Chapel in the Garden, now permanently located directly behind the FCUCC church building in Angola, IN. 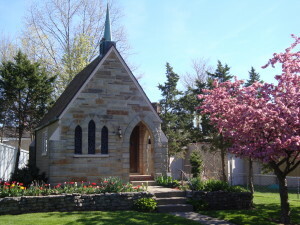 The Chapel was constructed in 1949. It was dedicated as a memorial to the Reverend John Humfreys, who retired in 1943 after serving as First Congregational Church pastor for nearly 40 years. The Chapel was located behind the parsonage on North Washington Street, some distance from the Maumee Street church. It replaced a structure used by Reverend Humfreys for church meetings and counseling. Reverend Humfreys was so well-loved by the community, it was reported that every local religious organization donated time or materials to its construction in his honor. As time passed, the Chapel became known as a wedding chapel. More than 12,700 couples were married there in a five year period. Those couples represented 37 different states and eight countries. In November 1988 the Chapel made its way through the center of Angola to its current location on the campus of First Congregational United Church of Christ, 314 West Maumee Street. Led by church member Veryl Carpenter and others, church and community members raised over $20,000 to fund the move and restoration of the then 40-year-old Chapel. The restoration began with the reworking of the copper steeple. The Chapel’s wiring and lighting was repaired; the interior surfaces were scraped, stripped and repainted. Old flooring was removed and carpeting installed. Stained glass windows, donated by a local businessman, were added to the sidewalls. The garden was constructed around the Chapel to accommodate the concrete foundation that had been uprooted from its original location and moved intact with the 14-1/2 by 20-foot stone building. A stone and concrete wall surrounding the chapel garden was constructed using nearly 11 tons of stone, 15,000 pounds of sand, 177 concrete blocks and numerous bags of cement and mortar. Steps, sidewalks and a storage area were added. Hundreds of volunteer hours completed the move and restoration, and the Chapel was rededicated on May 20, 1990. Today the Chapel stands tranquilly in its garden surrounded by flowers and beautiful landscaping. It is still a favorite choice for weddings. Seating only 16 people, it is regularly used by small church groups and visited by community members. Its colorful story and quaint presence make it a special piece of Angola’s history. Contact the church office to plan a visit or to reserve the chapel for a wedding or reaffirmation.